The Thompson Divide area near Carbondale (Thompson Divide Coalition). Federal officials this week reaffirmed their authority over oil and gas drilling in the controversial Thompson Divide area near Carbondale even as the fierce debate in Colorado over which government entities should regulate the industry has spilled over into the state’s key U.S. Senate race that could determine which political party controls Congress. U.S. Rep. Cory Gardner, a Republican who represents the heavily drilled northeastern part of the state and opposes local fracking bans, is challenging incumbent Democratic Sen. Mark Udall in a close race that some analysts say could shift control of the Senate to the GOP in November’s mid-term election. Last month, Gardner attacked Udall for not taking a stance on a pair of controversial ballot initiatives funded by Vail-area U.S. Congressman Jared Polis that would have tilted regulatory control over oil and gas drilling from the state to county and municipal officials. An 11th-hour deal forged by Gov. John Hickenlooper ultimately derailed the initiatives soon after Udall did take a stance opposing them. Now it appears that Gardner may be advocating for some degree of local control over more than 60 oil and gas leases on a huge swath of federal land in five counties on Colorado’s Western Slope. The area known as the Thompson Divide includes more than 220,000 largely undeveloped acres of national forest and BLM land. 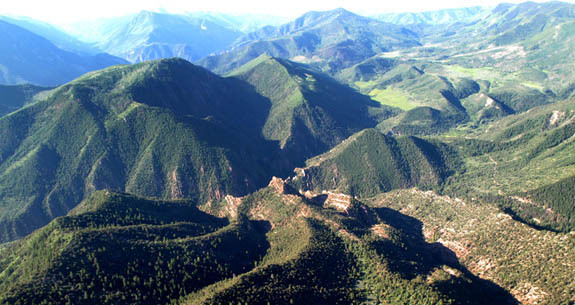 The BLM recently affirmed its local field office decision to suspend and thus keep alive 25 leases in the Thompson Divide that officials in Glenwood Springs, Carbondale and Pitkin County hoped would be allowed to expire. A 2013 bill called the Thompson Divide Withdrawal and Protection Act introduced by Colorado Sen. Michael Bennet would remove 183,000 of those acres from consideration for any future drilling or mining while compensating the current leaseholders for their mineral rights through several possible options. Late last year, Udall signed onto Bennet’s bill, much to the delight of the overwhelming majority of local residents who oppose drilling proposals in the area – including the entire board of Pitkin County commissioners chaired by Republican Rob Ittner. Republican U.S. Rep. Scott Tipton has not officially backed Bennet’s bill but instead hopes conservation proponents can work out a deal with energy companies that own the existing leases. Last week on Aspen Public Radio Gardner was asked to weigh in on the Thompson Divide debate and said he looked forward to having “conversations with the community” about the topic. Pressed on Bennet’s bill, Gardner appeared to back local control. “Again, that’s something that needs to be led at the local level and not something I want to come in and impose from the top down,” Gardner said. Udall’s campaign pointed out what it deems Gardner’s hypocrisy on the topic. “Congressman Gardner’s comments not only show that he’s been too busy playing politics to give any thought to the issues affecting the West Slope and Roaring Fork Valley, but they also demonstrate his propensity for saying one thing when he’s in one part of the state — Aspen talking about Thompson Divide — and another thing when he’s in a different part of the state — Weld County talking about fracking,” Udall campaign spokeswoman Kristin Lynch said. A Gardner campaign spokesman countered that the congressman is being consistent. This is not the first time Gardner has appeared to support some level of local control over oil and gas drilling, particularly as it relates to state versus federal regulation.